Note this page is still being edited. As such it still contains many errors and missing parts. I arrived at Central station at around 8:20 to find a line of about 20 people already on the platform. Also present were a number of media people, and SLR executive staff. Sandy who handles SLR publicity had a giant ticket number 1, ready for the media throng. 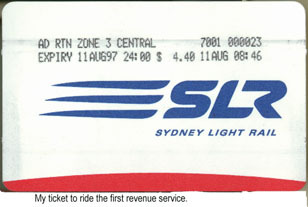 At about 8:30 Rob Schwarzer issued the first ticket to Paul Osbourne, a 55 year old from Haberfield, who was the lucky person at the head of the queue, with the full attention of the media. At about this point my Girlfriend, Jenny, joined me in the queue which started to slowly move forward. Today FM were paying for every one's tickets and Rob operated the ticket machine for the first group people. The machine soon developed some sort of problem, resulting it being opened twice before we got to the head of the queue. As we arrived Rob handed over the operation of the ticket machine to some one else, and we duely received tickets 23 and 24, as tram 2105 glided up the Castlereigh ramp and onto the concourse. Soon after 2105 pulled up next to the ticket machine, Rob Schwarzer made a small speach to the assembled media throng, and the proud holder of ticket number 1 boarded the tram, soon followed by an enthusastic thong. They let the tram load to its seating capacity only, via the front door, and just after 9am, with the accouncement 'stand clear, doors closing', the first revinue run departed, with not only a load of keen passengers, but 3 betacams and a number of sound recordists, who roved about interviewing passengers. Jenny and I were asked what we thought by a channel 9 crew. The editor back at 9 must have liked Jenny's comment, as about 5 seconds of her interview was used on the evening news!. We soon made our way accross George St, and then turned onto the reserved track with much flange squeal, the only time we heard any significant noise, and picked up a little speed before the Exhibition centre stop. At Convention about 6 secuity guards boarded, who disembarked at each of the stations around to Wentworth Park. After a fairly unevenfull ride through Pyrmont Bay, Casino, John St Square and the Fish markets, we pulled into Wentworth Park station were we had a few minutes for Photo's, and Rob Schwarzer did another small speach for the media. Soon, it was ding ding, and we were away on our way back to Central. We picked up a couple of passengers along the way , and all was uneventfull untill Haymarket, were a pedestrian got a blast of the air-horn, and then at then at Haymarket station, the doors refused to close. After at bit of persuasion by the conductors, they closed, leaving them outside !. The driver opened the front door to let them back on. At Capitol Square, the driver asked that any one wishing to leave, do so via the front door. As we pulled into Central, we noticed the crowd had grown, boosted considerably by the presence of a large number of uniformed school children, and a group report to be called 'Link Up' held up pro-light rail banners for the media. As soon as we rolled to a stop the driver opened all doors and we alighted, and others started to board via all 3 doors. I grabed a few more photo's, and soon 2105 departed with another load of passengers, with what ever ailed the doors earlier cleared. Trolley Wire has since reported that 2105 was eventually replaced by 2101 in service - so 2105's door fault presumably got worse. The school children were still on the platform after 2105 departed and I walked down the Castlereigh ramp to get a shot of another tram turning into the ramp. After walking down Hay St and getting a few more pictures, I left the scene and high-tailed it back to work. Later in the day, at around 4pm, Jenny and I walked down to Pyrmont Bay and using Daily Telegraph token's, boarded a Wentworth Park bound 2104. The passenger mix was more courious 'ordinary' people instead of the high proportion of tram/rail fanatics of the morning trips. We alighted at Wentworth Park and waited for the next tram, which was 2102. This time, riding up the front of 2102 over the front power bogie, the ride was noticably noisier than in the middle of the other trams but still very quiet.. 2102 appeared to have a wheel flat or other defect,making the ride noisier that it other wise should have been. (Possibly a coin or some thing stuck to the wheel). We sped along the tunnels making quick stops along the way. While running back inbound, we were passed by 2 trams heading the other way, and at Central our tram proceeded to make another circuit, the driver announcing that the tram would terminate when it got back to Central, thus making it the last trip for 2102's first day. Jenny left the tram at this point, I stayed on for the trip back to Pyrmont Bay station, where we had boarded 2104 an hour earlier. The ticket machines didnt fare well, the problems at Central in the morning were not an isolated incident. It would appear quite a number of them jambed or crashed at various points, the machines at Wentworth Park and Pyrmont Bay were not taking coins by 4pm, I noticed a machine at Haymarket had crashed. The trams also suffered badly from cluster effect, with the 3 trams running several minutes apart, resulting in a long gap every 3 departures. This probably resulted from the 3 in service trams departing Central 5 minutes apart for their first runs in the morning. For the rest if the day, they stayed clustered instead of speading out. The Ticket machines were all still saying 'The vehicles are 7 minutes apart' even though the offical test timetable is 12 minutes frequency, and due to the clustering often a wait of much longer. So while the launch went off well with only minor ticket machine problems, after the media departed, the ticketing system went to pieces and the trams had a serious time keeping problem. I can only assume that as drivers and conductors gain experience, time keeping will improve considerably. Jackson Wells (SLR Publicity) All aboard! Sydney's new light rail opens to the public.